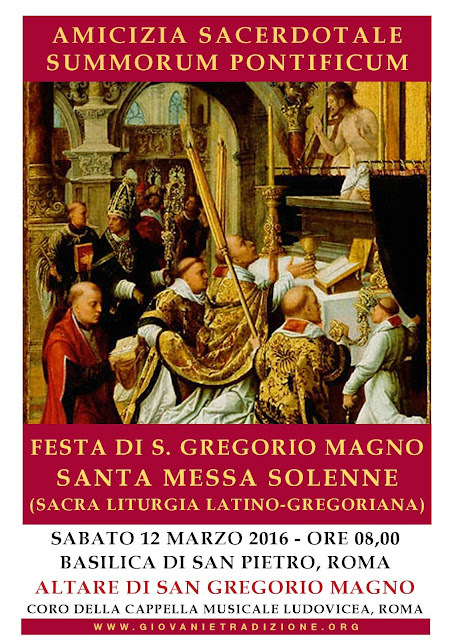 On the feast of St. Gregory the Great, the Father of the Latin Sacred Liturgy, the Association “Amicizia Sacerdotale Summorum Pontificum” has organized a Solemn Mass in St. Peter’s Basilica, at the altar of St. Gregory the Great, Saturday, March 12, 8:00 a.m. The altar is located on the left side of the church, near the entrance to the sacristy (#73 in the plan given below). UPDATE: Continuing a custom instituted by Pope St John Paul II during the Jubilee of 2000, Pope Francis is holding a number of extra weekly audiences on some of the Saturdays of the current Jubilee. Those who wish to attend this Mass are therefore asked to be at the Porta Sant’Ufficio at 7:15, and they will be accompanied into the Basilica from there.